Although it was not the primary goal of the ePistolarium to include images, the letters often refer to drawings, graphics or prints – sometimes included in the letter, sometimes not. Constantijn Huygens for example was not only much interested in the pursuit of knowledge, but also in the visual culture of his time. Being a nephew of the great pictor et inventor Joris Hoefnagel, he was a talented draftsman himself, and made sure that his sons were educated to draw as well. In the edited volumes at the basis of the ePistolarium, the various editors have not all acknowledged the importance of images. Some simply skipped the drawings or sketches correspondents included in their letters (the Worp-edition of Constantijn Huygens for example); others added these valuable sources in a sometimes schematic image or facsimile-edition in the back of the volume (the Oeuvres Complètes de Christiaan Huygens or the Leeuwenhoek-correspondence, for example). The corpora included in the ePistolarium basically follow the printed editions of the sources included. Our seventeenth-century correspondents often referred to drawings, prints or paintings; and many of them endorsed the epistemological importance of images. Recently, this has become a major topic on interest among historians of science (see for example: Sachiko Kusukawa, Picturing the Book of Nature, Chicago 2012. A useful link is: http://picturingscience.wordpress.com). We wondered if it could be possible to charter the use of (and reference to) images throughout the corpus (by use of words like: afbeelding, imago, figura, figure, vide; etc. ), in order to charter the use of images (and thus to give additional information on the letters). 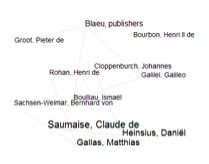 Moreover we wanted to see if some authors (or clusters of authors) are more inclined to refer to them or use them. A second option would be a semantic analysis, i.e., not to the images as such, but the words to describe them. There is an astonishing number of words, concepts, etc. to refer to images (either drawings, prints, paintings or even concepts) such as ‘contrafacta’, ‘conterfeitsel’, etc. Here, again, the question arises: can we detect patterns, networks, etc? The assumption that the ePistolarium could help to trace reference to images not included in the corpus is immediately confirmed when we try in Full Text Search the Dutch term ‘afbeelding’. The second hit (out of a total of six) refers to letter1642-04-07 (huyg001/2980), a letter of Constantijn Huygens to Marin Mersenne, in which he refers to an image Mersenne sent him – which was not included in the correspondence, but makes the researcher very curious. Other references give more factual information, such as 1682-04 (nier005/0070) a letter of Dirck Rembrantsz van Nierop to Joannes Droomers, were a schematic images are included in the ePistolarium. However, there is an insufficient number of letters to make use of the option to look for similar words. If we, by means of our own common sense, use try the Dutch term ‘teekening’, we see a similar result: two references to letters by Van Leeuwenhoek – both in which the microscopist refers to drawings he had sent, but are not included in the (digital) edition. Many more hits gives the similar Dutch word ‘figuur’ – no less than 92. If we take a close look at each of the hits, we have some references to actual images (sometime included in the edition, sometimes not), but also to some other subjects covered by this multivalent word. It might be clear that – given the increasing interest historians of science take in the use of images – the ePistolarium is an important heuristic tool, by which the rough outlines of the use of (references to) images can be chartered, and clues for further and more detailed research are given. But it might also be clear that the use of specific search terms is very important – ‘figuur’ could refer to an image, but also to a person, an abstract concept etc. The point is of course that we have many hits here – perhaps too many too handle at once. And, moreover, the terms have multiple meanings – figura could also mean ‘form’. We think that the ePistolorium is an helpful tool, both for qualitative and quantitative analyses. In other words, it is an indicative instrument, providing an indication for qualitative research. If we take a closer look at the frequency of the word ‘figura*’, it becomes clear that this word is much used by Christiaan Huygens and René Descartes. Projected in time, we see that it is most often used around 1650 (this is not corrected against the number of letters). And above is the diagram that results from ‘figure’. One wonders if A has any significance. The same is true for B. Given the number of letter around 1700, C is somewhat curious (and is in want of more qualitative research). 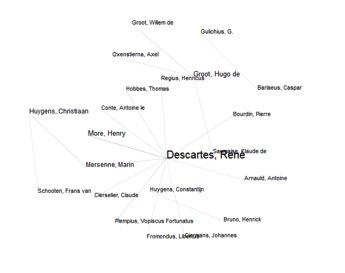 De correspondence network shows that the use of the term figura is most obvious in the network around Descartes. 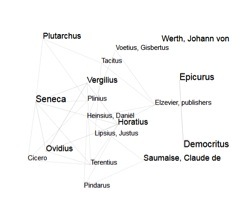 Co-citation shows interesting references to classical authors – and not only natural philosophers. This demands further research. 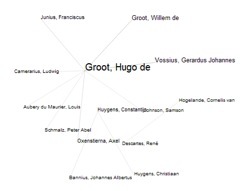 The term is most used in the correspondence of De Groot. Here – as we saw in Casus 1 – the tool is mostly an heuristic instrument. If, on the basis of the hits, we take a closer look at the letters indicated. It is most used in the context of the publication of Fransicus Junius, De pictura veterum (1637), in other words, it refers to a book on images, not to actual images themselves. A tentative conclusion might be that the ePistolarium offers very interesting opportunities for further research. Instead of leaving through indexes and thousands of pages, the researcher is put on track within a few seconds. Traces to, for example, the use of images are easily detected. Two remarks should be made here. The first concerns the actual content of the ePistolarium. As it is mostly based on earlier printed editions of letters, the ePistolarium follows decisions earlier editors have made concerning the inclusion of images – and these are highly inconsistent. Some editors included images, others not, and most often we find only a random selection, reproduced in schematic form or as a facsimile. A desideratum for the future would be to have an online-version of the original letters (if still in existence) in addition to the transcriptions offered in printed and electronic editions. A second point concerns the use of use of catchwords. It is clear that a successful search depends of the right use of catchwords- and it is here that it becomes obvious that seventeenth-century scientific discourse had a rich and complicated vocabulary. Besides the different languages used (Latin, French, Dutch, English; sometimes two or more used in one letter), each language in itself had words with multiple meanings. As such, the ePistolarium offers new prospects for further research – both in terms of network-analysis as in the meaning of words and concepts – a new electronic Begriffsgeschichte.